Working with video files, especially editing them, is a task that requires a specialized application that can provide all the tools one needs. 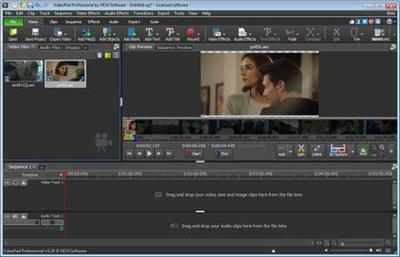 Among the software applications of this kind you can find VideoPad Video Editor. The interface of this utility is divided into several parts (e.g. Media List, Effects, Transitions, Files, Clips, Video Track, Audio Track, Overlay Track), which may make everything seem a little hard to operate. You can capture video from a camcorder or another device like a webcam or a TV capture card, and once you have added files and sequence clips to the queue, you can start editing them. Customize the duration of the effect. Import pre-recorded narrations, sound effects or music. Add text captions to your movie. Save to your PC as a high-quality digital movie.